The table and chairs set are perfect for tea parties, snack time or creative play. 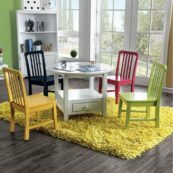 Kids Only Furniture offers stylish and durable Table and Chair Setsfor your little ones.Table and Chair Set comes with one table and two chairs. It is equipped with shelves under the table top; these are perfect for holding books, crayons or other tools, keeping the table tidy and presentable when it’s not in use. These are constructed from solid birch wood and have a non-toxic finish. We never use particleboard, MDF or other synthetics that can have high levels of formaldehyde. Our collections are exclusively designed to provide a cute and functional work area for your playroom or for any room in your house.